India houses 11 of the World’s Fastest growing 50 cities! Can a cricket team succeed with mere presence of a star batsman in the playing squad? No, for a team to stay consistently on top there needs to be at least a clutch of 3-4 good players in the team that can chip in when the wickets are down. Of course, the intention of the star batsman will always be perform at the best of his capabilities, but that does not warrant a winning knock from him every time he comes out to bat. Other players also need to contribute to the team’s agenda to ensure a victory. Similarly, the India growth story could not have graduated to the next progressive level by the virtue of its 4 big metro cities – Delhi, Mumbai, Kolkata and Chennai. These key metropolitan cities are akin to those star performers, the main pillars of the nation; but they can not take the nation to new heights alone by themselves. Most of these iconic cities are almost saturated to the extent of incremental value they can add to the nation’s GDP. They now need efforts from other emerging cities to foster key infrastructural facilities in order to drive growth and support new industrial hubs in their local vicinities. According to City Mayors Foundation survey, there are 37 such Indian cities among the world’s 300 fastest growing urban centers such as Ghaziabad, Surat, Faridabad, Nashik and Patna to name a few leading Indian destinations. While Beihai from China topped the list of cities that is expected to clock fastest average annual population growth from 2006 to 2020 to the extent of 10.58%, India’s Ghaziabad was tagged as second fastest growing city in the world on the back of construction boom in the city. While Ghaziabad’s average annual population growth rate is likely to tick by record 5.2%; Surat, India’s diamond city, lags only by a bit with its 4.99% population growth rate placing it at coveted 4th position in the world and 2nd fastest growing city in India. Surprisingly, Nashik, the wine capital of India, has notched 16th rank amongst the list of world’s fastest growing small metropolitan cities; followed by a rapidly growing Bihar’s city, Patna, at 21st spot led by its dominance as a major agricultural hub. To sum it up, 11 small urban areas from India including Rajkot, Jaipur, New Delhi, Pune, Indore and Asansol feature in the top 50 fastest growing cities in the world. Will these small cities be able to stoke India growth story for long? 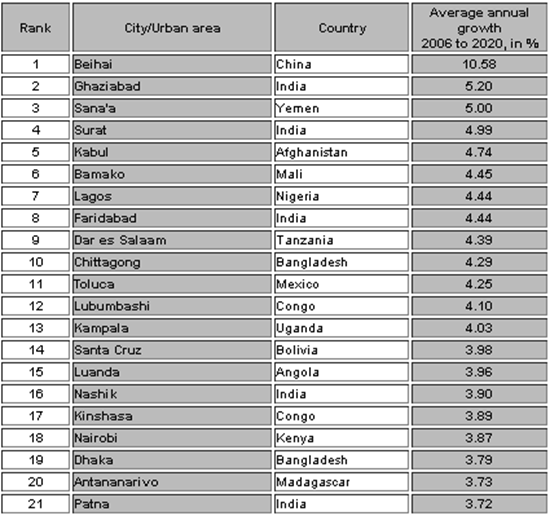 "India houses 11 of the World’s Fastest growing 50 cities! ", 5 out of 5 based on 1 ratings. Pakistan’s Telecom Authority ridiculously Bans 1600 words from SMSes, DoT/ TRAI please don’t follow cue! Aami gorbito ASANSOL e jonmor jonno. 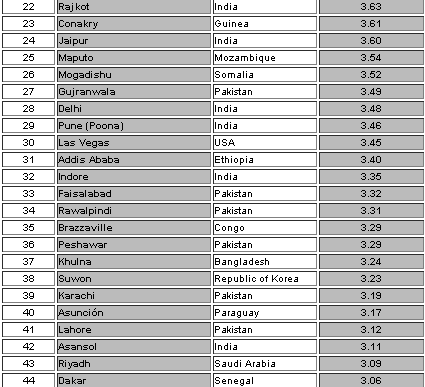 ASANSOL holo world ar modhey 42nd ranked fastest growing city. ASANSOL ranked 42 among the top 50 growing cities in the world…. 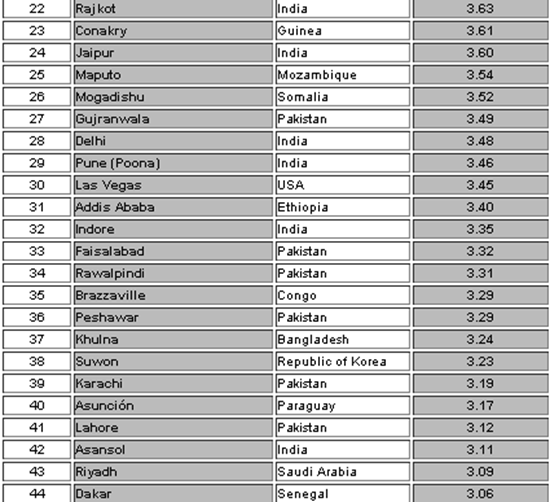 Asansol ranked 42 in world top 50 growing cities……proud to be part of Asansol….